As the saying goes, it is important that we start the year off right. 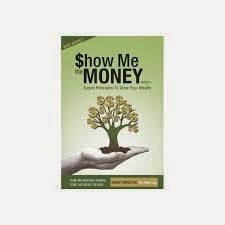 I have just finished reading this book 'Show me the Money' by Teh Hooi Ling. Most of us would have known her for her writings on investment in the Sunday Times or Business Times. psychology of investing and REITS. The chapters I liked most are chapter 2 and 3. In chapter 2, using lots of data and comparison, it shows the reader why one can use this successful and proven method as part of his/her investment strategy. Chapter 3 is about market timing, the main message I guess is one should time the market based on valuation and not NEWS. In conclusion, I would recommend this book to someone who is starting his/her investment journey and even to those who has been investing for many years. It should help the novice to build his fundamental knowledge and the experienced ones to fine-tune their strategy. Indeed. It will be a good start. No matter where you start, more importantly is that you will be getting closer to the end point. Where did you get this book? I've been meaning to read her entire series, but couldn't find any of them in my local Popular. Hi J, I borrowed from the library. Time to buy car ... HUAT AH? ?